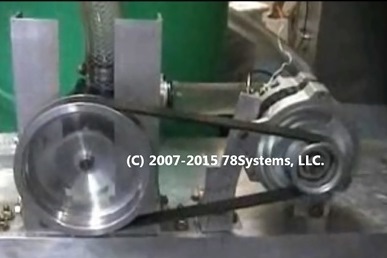 Alternator converted to a motor driving a high-speed turbine water pump. How to Convert an Alternator to A Motor. A Low Cost Alternative to A High-Power Brushless Motor. A Car Alternator Can Be Made Into A Powerful Hybrid Brushless Motor In A Couple Hours With Common Tools. See streaming videos below of converted car alternators driving a high-capacity water pump and a 2.8 Horsepower (HP) Dynamometer Load. Use for electric vehicles, robotics, industrial, alternative energy, experimental electric aircraft, and automotive applications. Larger alternators converted to motors from buses, trucks, boats, and aircraft may produce significantly more power. Click here to see video shows a small car alternator from a Chevrolet Camaro powering a dual-output, high-capacity water pump. Click here to see video that shows a small car alternator from a Chevrolet Camaro putting out 2.8HP (Horsepower) driving a dynamometer load. Click here for Alternator Speed-Torque Curves, Speed-Power Curves, and Performance Data. An alternator converted to a Hybrid Brushless Motor provides a low-cost alternative to brushless motors (BLDC) because alternators are mass-produced way beyond the quantities of brushless motors, and they have dynamic behavior similar to brushless motors in a wide range of applications. China has effectively cornered the market on the key ingredient of brushless motors -- rare earth metals, which are used for the permanent magnets in a brushless motor (BLDC), so brushless motor prices keep increasing. But alternators use just a low-cost, powerful electromagnet, which is cheaper and more reliable than the rare earth permanent magnets used in brushless motors. The electromagnet is more reliable because it is not subject to demagnetization, and it does not have the risk of flying off the rotor at high speeds like rare earth permanent magnets used in BLDC motors. And alternators are readily available worldwide -- as close as the nearest auto parts store or junk yard. What is a Hybrid Brushless Motor? All power drive current to this motor is brushless: drive current passes only through the stator and does not go through any brushes. Only a small field current passes through brushes and smooth slip rings to the rotor. This is a highly reliable design with minimal abrasion (unlike commutators in conventional dc motors), which is typically used for resolvers and synchros on aircraft, and high-reliability industrial applications. This is called a Hybrid Brushless Motor since it has a combination of brushless power drive current and a small brushed field current. This Hybrid Brushless Motor is functionally very similar to a conventional brushless motor except that it has an adjustable field, unlike a conventional brushless motor, which has a fixed field. This field is adjusted by applying a small dc current, typically 0.5A – 4.0A. This can give better performance than a conventional brushless motor by producing full torque at BOTH low speeds and high speeds, compared to a conventional brushless motor which tends to lose torque at high speeds. An automotive alternator converted to a motor can exceed the performance of both brushed and conventional brushless motors because of the combination of its brushless drive current and adjustable field. A car alternator changed over to a motor can put out in excess of 1.0 HP -- in many applications far above that, depending on the alternator, how it's converted, and how it's controlled. An automotive alternator converted to a motor is much less expensive than a conventional brushless motor with the same power output. A car alternator that can be readily converted to a powerful motor costs about $100.00, but a conventional brushless motor that produces about the same power output typically costs far more -- well over $500.00 and is often more difficult to obtain with long order lead times. In addition, a car alternator functioning as a motor has more versatile control than a conventional brushless motor, and it can have more power and torque at high speeds than a conventional brushless motor of similar size due to its adjustable field. 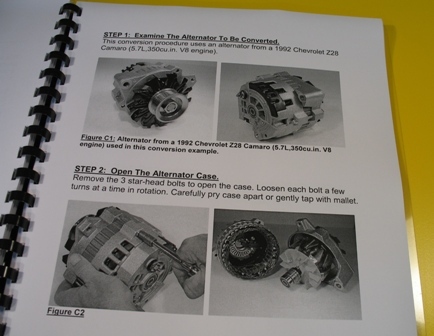 Our Alternator Conversion Manual, "How to Convert an Automotive Alternator to a Hybrid Brushless Motor" shows in clear step-by-step instructions with photographs how to do the conversion. It also explains how to drive the alternator as a motor. It includes common-sense explanations of how the converted alternator functions as a motor with clear, easy-to-read diagrams. After reading our how-to guide, you will be able to convert a car alternator into a powerful, reliable, and low-cost Hybrid Brushless Motor using low-cost, common tools, and you will understand how this new motor works and the advantages this new motor has over conventional brush and brushless motors. What can you use this Hybrid Brushless Motor for? -- anywhere a powerful, low-cost, high-reliability motor can be used: industrial, electric vehicles, alternative energy applications (converting gasoline, diesel, pneumatic, and hydraulic machinery and equipment to electric) robotics, model aircraft, scientific, automotive, aircraft, marine, and scores of related applications. This provides a reliable and low-cost alternative to high-power brushless motors for many applications which is easily acquired and second-sourced. With over 25 years in high-tech industrial and aircraft power system development, put our know-how to work for your innovative projects. Parts kit to convert alternator to motor.